And gets “experimental” modding tools. 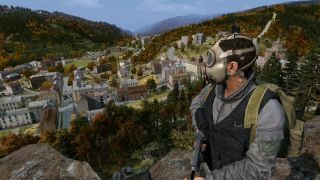 The first beta build of DayZ has hit the experimental branch with new base building, “player restraining” and vehicle updates. “I’m excited about this first step to a more polished gameplay experience with more endgame goals to achieve” writes lead producer Eugen Harton in a DayZ blog post. “experimental” mod tools are being worked on to give the community a way to contribute new ideas. The tools will launch alongside a DayZ Steam Workshop to make sharing mods easier. DayZ has had a choppy development since it first arrived late 2013 and became a craze for a time. It may be buggy and messy in some ways, but it still creates good stories. Chris Livingston returned to DayZ this summer and found a lot to like.